Each month in the Searchroom a new Document of the Month goes on display. The DoTM for April 2014 is a set of four papers relating to the repatriation and reburial of Captain Fryatt in 1919 (D/P 174/1/83). 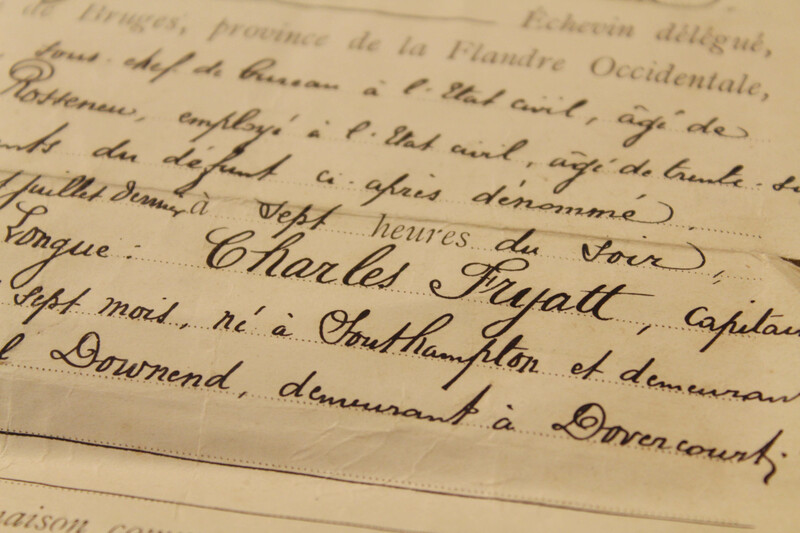 Charles Algernon Fryatt was born in Southampton in 1871, but while still a child moved to Harwich. On leaving school he followed his father’s example and became a merchant seaman and in 1892 joined the Great Eastern Railway Company as a seaman on the SS Ipswich. He rose through the ranks and at the outbreak of the First World War was a master mariner engaged in the G. E. R. continental service between Harwich and Rotterdam. He continued to make regular voyages on this route despite the German blockade. On 28 March 1915, while in command of the SS Brussels he was ordered to stop by a German U-Boat when near the Maas lightvessel. Seeing that the U-Boat had surfaced to torpedo his ship, he attempted to ram it and forced it to crash-dive. Thereafter he seems to have become a ‘marked man’ and on the 25 June 1916 the Brussels and her crew were waylaid and captured by five German destroyers soon after leaving Holland for the return journey to Harwich. Captain Fryatt was charged with attempting to destroy a German submarine and was tried by Court Martial at Bruges Town Hall in Belgium on 27 July 1916. He was found guilty and executed on the same day. The execution provoked international outrage and was widely regarded as murder. In July 1919 Captain Fryatt’s body was exhumed from its resting place in a small cemetery outside Bruges and returned to the United Kingdom for reburial. After a funeral service in St. Paul’s Cathedral on 8 July 1919, his coffin was taken by train to Dovercourt and interred in All Saints’ churchyard. He was posthumously awarded the Belgian Order of Leopold and the Belgian Maritime War Cross. He was survived by his widow Ethel and seven children. 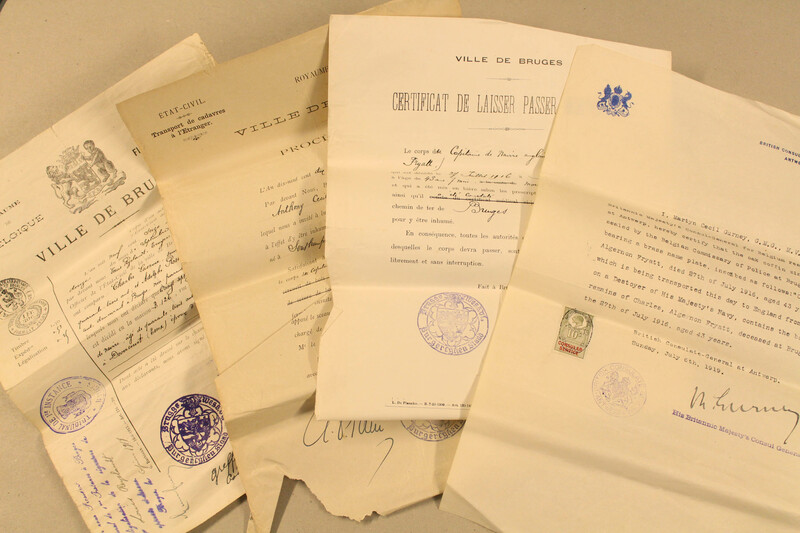 The papers will be on display in the Searchroom throughout April 2014.